Skylook brings Skype inside Microsoft Outlook - Record Skype Video Calls Free with VodBurner! 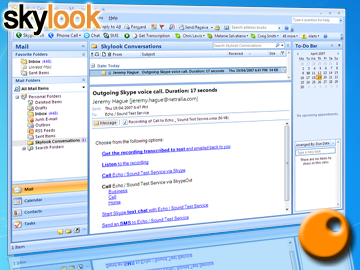 Skill: Skylook brings Skype inside Microsoft Outlook. PC-to-PC calls, voicemail, instant messages and SMS*. (Calls are recorded to MP3 for storage and archiving).